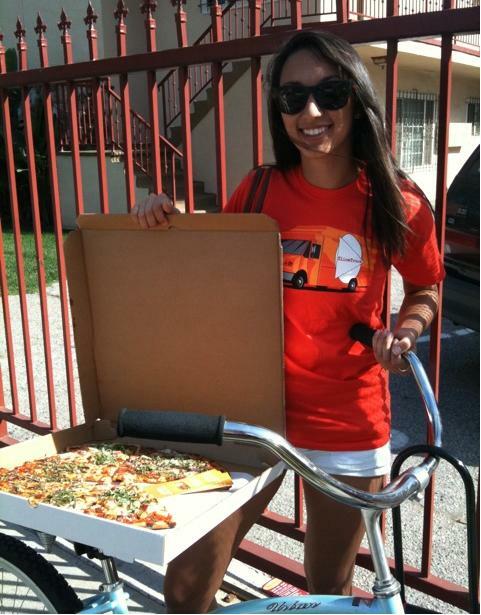 Look what a SliceTruck T-Shirt does for you, it makes you look amazing. On top of the shirt, this girl is doing everything right, riding the cruiser over for a whole pie... Some people just know how to live a great life and look good doing it. We've got them for sale, $15 but if you mention that you saw this posting you can get one for $10. They're American Apparel, and you'll love it for the rest of your life, buy 3. And not to mention the respect you'll get from the SliceTruck when you order with your Tee on. A lot of respect.